Around nine thousand years ago, a group of people founded a settlement in a low wetland area in what is now central Turkey. They built a cluster of rectangular clay brick homes with adjoining walls and entries through their roofs. Their homes had built-in ovens and white plastered interior walls decorated with red geometric murals and with the mounted horns of bulls. As in many ancient settlements, residents over the generations built new homes directly on the remains of older ones, increasing the size of the mound. After several centuries, the center of settlement shifted to another nearby site, and by around 5700 B.C., the settlement had largely dispersed. The area’s climate grew drier, preserving the compacted remains of the proto-city from erosion. Today the remains of the settlement, now called Çatalhöyük, are considered one of the most detailed and important records left by humans in the Neolithic era — roughly 9000-5000 B.C. (after the development of agriculture but before metallurgy). Çatalhöyük was first excavated by British archaeologists beginning in the 1960s before being temporarily abandoned. New excavations began in the early 1990s, led by Stanford University’s Ian Hodder with a team of dozens of U.S., Turkish, and international researchers painstakingly examining the site to understand more about the lives of the people who built it. “Our aim has been always to try to understand why so many people came together in a very dense settlement and produced this very elaborate symbolism and art,” Hodder says. 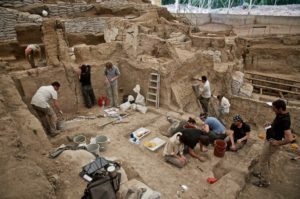 In that context, Çatalhöyük also became a perfect place to test a theory advanced by a group of cognitive archaeologists — that the Neolithic era was a time of swift evolutions, not just for human technology or culture, but for human cognition itself. According to the theory, human minds in the Neolithic era became capable of new levels of abstract thought, creativity, and individual identity. Creativity, meanwhile, can be assessed by looking at the pace of innovation, whether of new technologies or new ways of using abstract symbols in art. Compact settlements and expanding trade networks can account for some of this growth of new ideas, but others might be a sign of evolving cognitive abilities. “Many cognitive archaeologists have argued that in early time periods, there is not a strong sense of an integrated separate individual self,” Hodder says. “The self is seen as much more integrated with other people and with the natural world around it.” Hodder notes that sites like Çatalhöyük can offer significant physical clues about people’s senses of individuality, in the form of personal adornments and especially in the ways that the community treated its dead. (In addition to being a living settlement, Çatalhöyük was also a necropolis, with the dead commonly being buried beneath the floors of its residents’ homes). Rather than being something that was acquired over time, Hodder thinks that humans may have had the potential for abstraction, creativity, and individuality well before the Neolithic — perhaps for as long as we’ve been Homo sapiens. “From the archaeological evidence, it seems that the mind has always had the same set of potentials, but in different contexts the mind works differently,” Hodder says. Learn more about Ian Hodder’s research and the ongoing excavations at Çatalhöyük.